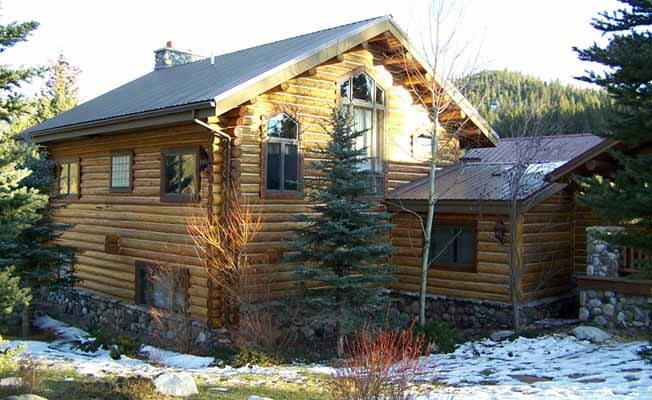 Moose Landing: This is an outstanding 4,000 square foot cedar home on 3.5 gorgeous acres with five bedrooms, 2.5 baths at the entrance to Big Sky. Just six minutes to the mountain and footsteps to the river, it offers all the activities that Big Sky has including skiing, fishing, golf, rafting, and horseback riding. Transportation in the ski season is easy. Board the ski shuttle across the street and ride to the main mountain in just minutes. MOOSE, ELK, BIG HORN SHEEP!!! Right out your window! If you can pull yourself out of our fabulous beds, you will be ready for the next day's skiing adventure with virtually no lift lines. Montana's only high speed 6-person lift and two mountains joining together on one ticket, creating 5,400 acres of unique skiing, is five minutes away by car or shuttle, just across the road. Relax in your own game room featuring pool and poker tables. Rustic custom made furnishings throughout complete this wonderful home. If fishing is your passion, step from your door and cast your line into the beautiful Gallatin River, or 'Hog Alley' as it is called. Yellowstone Park, just 50 miles away, has so many adventures awaiting you including snowmobiling, abundant wildlife and Old Faithful. Join the lifestyles of the rich and famous. It just doesn't get any better than Big Sky Montana!! Elk Crossing: Shhh! Don't tell anyone about this untold secret! Imagine two mountains combining on one lift ticket, offering 5,400 acres of runs with virtually no lift lines. Skiing is only 5 minutes away and the shuttle is just up the road from this rustic 4000 square foot luxuriously furnished log home, featuring 3 river rock fireplaces. Big Sky, Montana means 'Big Adventures' including nearby Yellowstone National Park offering snowmobiling, the Grizzly Discovery and much more. Our guest book is filled with comments about our cozy beds. Return home to a huge game room with an old west pool table, full bar and fireplace. After being our guest in this fabulous home on 3.5 acres on the South Fork of the Gallatin River, we guarantee you'll be back for more. Your fish stories will be true! Fry' em up. Amenities: three king-size beds, set of twin beds, one rustic log bunkbed (two beds), nine foot tournament size pool table, poker table. A winter pleasure! Walk down your private path to river's edge and cast your line!. Cast your line! Multiple fireplaces, phone, TV, DSL - Internet, VCR, Stereo, CD player, full kitchen, microwave, dishwasher, refrigerator, ice maker, cooking utensils provided, linens provided, washer, dryer, Jacuzzi tub in bath, private outdoor hot tub/Jacuzzi, sauna, garage, gas grill (BBQ), No Smoking PLEASE!